Our gloss finish hardboard coasters are perfect for tradeshow give-aways, craftshow products, sales meetings, corporate handouts, fund-raising, weddings, parties, or for home or office use. Durable, with cork back, these coasters work well with a photograph, artwork, logo or both. And because we use original artwork (yours or ours) and never a template, you’re guaranteed that your coasters will be unique. Available in quantities of 100-plus, and unlike many imprint items that get tossed in a drawer, our coasters are a distinct product that customers and prospects actually use. Combine different images to qualify for quantity pricing. See our Pricing Page or Contact Us for additional information. Also, a great fundraising program! Using coasters for promotion is a great way to get… an keep… your name and/or message in front of your customers. Unlike many promotional products, these coasters are actually used and not discarded or thrown in a drawer. Every day your customer or prospect will set their mug onto your coaster and see your message. We’ve had customers tell us that they have met competitors when out in the field, or at a tradeshow that tell them that: “Everytime we go into XYZ company to pitch our product… there’s one of your d**n coasters sitting there with your name on it!” We’ve sold thousands of these because they work. Contact us today to learn how our high quality coasters can be used to promote your company or organization. Are you a photographer or artist who sells at craft or art shows? Do you wish you could increase traffic to your booth and still turn a solid profit? If you answered “YES”, then these coasters are the right product for you. By putting your images on these high quality coasters, you are providing an additional, alternative purchase opportunity to your customers. By offering these coasters, custom imprinted with your unique image, you are drawing prospects into your booth to purchase something that they may see as a bit more affordable. The added bonus to you is that they will also be seeing your higher end items. You can provide a selection of coasters so customers can create a custom “set”, just for themselves. Because these coasters sell from between $4 and $5 each, you can offer a set for under $30, still make a good profit, and showcase your higher end items. Contact us today to learn how our high quality coasters can provide a win-win situation for yourself and your customers! These high quality coasters work exceptionally well for fundraising. Sell directly and keep the profit. Or, take orders. You design the program… sell individually or in sets… Maybe add a holder? The choice is yours. Ideal for fundraising programs involving kids. They can even be used in conduction with a tile mural fundraising event. You’ll be raising money by selling a unique product that the purchaser will actually use. Your logo, photograph, artwork (or combination) is permanently imprinted into the coaster making it attractive and very durable. 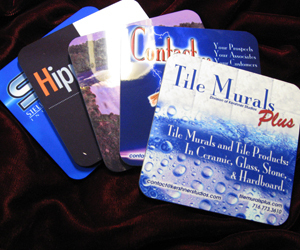 Contact us today to discuss your next fundraising event and learn if Tile Murals Plus coasters would be right for you! Use up to 4 different images for you 100 coaster order. Need more images? Contact us to learn more. We’ll be pleased to work with you to create your custom order. rounded corners approx. .125″ thick: $3.10 each (100 unit minimum order). Learn about additional “Plus” products from Tile Murals Plus.